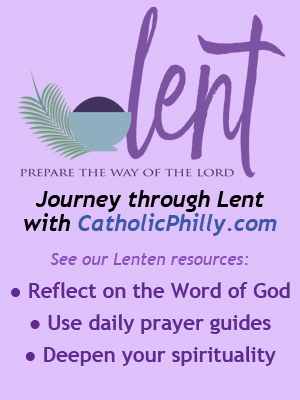 In this series from the Little Sisters of the Poor, Sister Constance Veit shares weekly reflections on journeying with Mary through Lent. 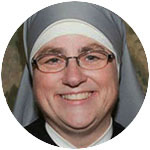 The seven sorrows form of the rosary provides a unique way to enter more deeply into God’s love for us, and Sister Constance invites you to offer this prayer for young people in particular this season. You can find instructions for praying the seven sorrows rosary here. This mystery gives us a lot to think about. In the Flight into Egypt we see that it didn’t take long for Jesus to become a sign of contradiction, and we are reminded that in every age misunderstanding, opposition and even hostility accompany the followers of Christ. The cross is always present. The Flight into Egypt reminds us to pray for the innocent young victims of abortion, child abuse and violence of all types, for refugees, migrants and the homeless, and for those who are persecuted for the sake of Christ. As we remember these worthy intentions, let’s also pause and reflect on what the Flight into Egypt teaches us about Mary and Joseph. I’m sure the couple had prepared a safe and comfortable home where they expected to raise their Son. But Jesus was born in primitive circumstances beyond their control. Then the young family was forced to leave their idea of home behind for good, becoming refugees in a foreign land. In order to protect their very special baby they left everything behind and experienced insecurities and deprivations of all kinds. But no sacrifice was too great for them. They faced their new situation with courage. After the fiats of the Annunciation and the Presentation in the Temple, God asked another fiat of Mary and Joseph, drawing them further into the unknown. Something we notice in working with young people is that for some, discernment never seems to end. We call them perpetual discerners! I attended a vocation talk where the speaker, a theology professor, recognized this tendency and emphasized that vocational discernment is not meant to go on indefinitely. It should come to a definite end with a committed “yes” that leads to action. I thought that was very good advice. This is what Mary and Joseph did, isn’t it? Each time they received a message from an angel, they sprang into action. In the Flight into Egypt, they traveled light in order to hold Jesus close to their hearts. As we ponder this mystery, let’s ask for young people to receive the grace to listen attentively to God’s voice speaking in their hearts, and the courage to say yes — to take risks and leave everything behind, putting out into the deep and going wherever God leads them, even when he leads them to the cross. Let’s also ask for young people the grace of compassion and empathy for those who suffer in any way, especially for those who have been wounded in any way by abortion, for migrants and refugees who find their dignity ignored, for the homeless and anyone who is vulnerable before the inhumane attitudes of our throwaway culture.